Looking for a better and more reliable UV option for your backyard pond, water feature, or home aquarium? RK2 is proud to offer our new XFLO UV Sterilizer. Our design team has a combined 60+ years experience and we meticulously worked to create the most user friendly UV solution available while ensuring users a technically sound product they can trust to get the job done right. Whether choosing our XFLO UV Sterilizers with our standard output, three inch diameter model, or our high output five inch diameter model, XFLO UV has the best solution for your specific needs. “L” Shaped flow pattern. Allows for better hydraulic mixing of incoming water. This virtually eliminates “dead” zones within the UV body and allows for more efficient UV Sterilization. Unionized water ports. 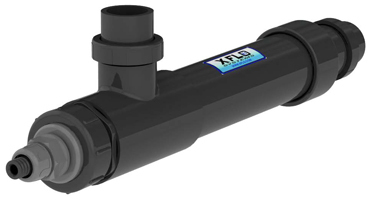 The 3” XFLO models are standard with 1.5” Unions while the 5” XFLO High Output models come with 2” unions. Single ended UV lamp and quartz sleeve access. Makes for easy replacement of lamps and sleeves. You can now change or clean a quartz sleeve without disassembling the entire front end of the UV! No twist lamp cable fittings. Remove lamp cables without the use of tools and prevents the cable from twisting while unscrewing, which could possibly damage the wires inside. American-made UV lamps. XFLO standard and high-output lamps are made using hard quartz, coated, non-ozone emitting lamps. These lamps prevent “scaling” of lamp and quartz sleeves which inhibits UV light from penetrating the water.